Any android app has two parts in it – frontend and backend. Frontend refers to the visualization of the components i.e. how your app will look and appear to the other users. Backend part refers to the logic behind the functioning of your app. Whenever we click on any button or submit any form, the backend code decides what action to perform next or what to do with the data received from user etc. In our previous tutorials, we have seen how different types of layout are useful for for GUI designing which is the frontend part. Here in this tutorial, we are going to focus and code for the backend part. In our example, we will take input from the user through EditText view and will display it in the TextView. Additionally, we will also get to see a buttonClickListener that is used to define the action to be performed when a button is clicked in the app. Below is th design that we will be working on. After setting the main layout using the setContentView() method in the onCreate() method, attach the global variables that we defined to the GUI views using findViewById() method as shown below. As the name of the method suggests, findViewById() returns an instance for the view defined in layout XML. In other words, this method is used to get the view instance in Java, that you have made and used in layout XML. This is done by mentioning the id of the view that you have defined in XML. The view created in XML is used in Java to manipulate it dynamically. Note: findViewById() method returns only View, but it does not tell which view is returned i.e. whether the view is Button, TextView, EditText, etc. Therefore, you need to typecast the view returned by this method. Once you add this code, whenever th submit button is clicked, the method onClick will be called and the code inside it will be executed. We have used getText() method to get the text entered in the EditText views. But getText() method returns an Editable instance and therefore we have typecasted it to convert it into String for further use. This can be done by using the toString() method. Note: We defined editName and editPassword as global variables, hence they can be used in any method. Now, whenever the submit button is clicked, onClick() method of submitButton is called and the user input values are stored in the name and password variables using the getText() method on EditText instances. 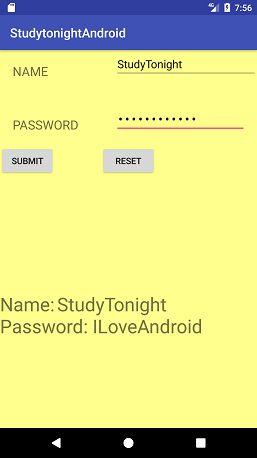 Then, using setText() method, the input values are displayed in the TextView. You just need to set text equal to ""(empty), for both the EditText as well as for TextView. Additionally, to get the typing cursor on the Name EditText field, we can use requestFocus() method with the editName instance. 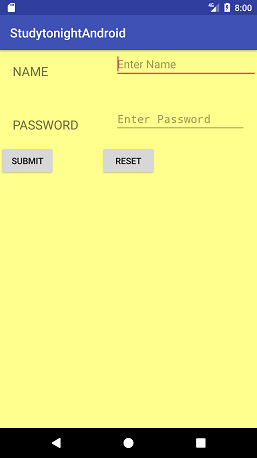 You can also add validation to this like display a message if the user leaves the fields name and password empty and taps on the submit button. In that case, all we have to do is check if name or password is empty, if found empty, display a message using a Toast saying, both the fields are required.